One of the leading critics of the brand of atheism popularised by Richard Dawkins will today give the first in a series of sold-out lectures at the University of Aberdeen. Over 1200 people are expected to fill King's College Centre over the course of the Gifford Lectures – the UK's leading intellectual event dealing with science, philosophy and religion. 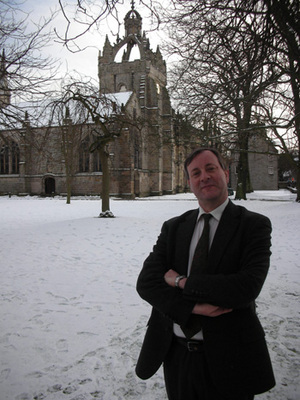 This year's series will be delivered by Professor Alister McGrath, the Head of the Centre for Theology, Religion and Culture at King's College, London. He will give six thought-provoking lectures on the human quest for meaning in the universe, beginning tonight (February 10) at 6pm and on February 12, 17, 19, 24 and 26. A former atheist, Professor McGrath has a special interest in the interaction of the natural sciences and the Christian faith and has been a prominent critic of Oxford's evolutionary biologist Richard Dawkins, author of The God Delusion. His own work includes The Dawkins Delusion;The Open Secret: A New Vision for Natural Theology; and his most recent book A Fine-Tuned Universe: The Quest for God in Science and Theology. Professor Trevor Salmon, Chair of the Gifford Committee at the University of Aberdeen, said: "Professor McGrath's lectures will open up some of the deepest questions of life in an accessible and unquestionably controversial manner. "There has been huge interest in his Gifford appearance – the lectures themselves sold out long ago – and we are delighted to have him in Aberdeen over February. The Gifford Lectureships have featured some of the world's pre-eminent thinkers in their fields and Professor McGrath's appearance continues that proud and distinguished tradition." The prestigious Gifford Lectureships were established in 1888 at the bequest of Adam Lord Gifford (1820–1887), a senator of the College of Justice in Scotland. Lectures are given on an annual rolling basis in the ancient universities of St Andrews, Glasgow, Edinburgh and Aberdeen. The Gifford lecturers have included a broad cross section of scholars of theology, philosophy and ethics, as well as historians, scientists, and writers and include even Arthur Balfour, British Prime Minister from 1902-1905. Other previous speakers include Iris Murdoch, Arnold Toynbee, Niels Bohr, Karl Barth, Steven Runciman, Paul Tillich, and Noam Chomsky. The lectures are often subsequently published to significant stature in the intellectual world.